My name is Sylvia Phillips. I am a 53-year-old mother of nine children, although most of them are not children any longer! My sons are ages 35, 33, 27, 24, 21, and 10. My daughters are ages 19, 16, and 13. We have been homeschooling since 1984. When we were first starting out we operated in a very rigid and structured manner. Every problem in every workbook had to be completed! Over the years as we added more children to our family, our homeschooling style became more and more relaxed. It was not until 2000 when our now 13-year-old daughter was diagnosed with a brain tumor which needed to be removed immediately that we were sort of forced into this thing called unschooling. She and I were living in a hospital for two months two hours away from home. Every day there was a new reason why she was not expected to live.Thank God she pulled through every complication, but needless to say, my mind was not on organizing school work for the children at home. They became unschoolers! They filled their days with writing scripts for making videos, reading, creating, writing and playing. Their intelligence did not suffer despite such neglect! When my daughter was finally released from the hospital, she was a totally different child. She had suffered many disabilities, one of which what turned out to be a lifelong uncontrollable and unpredictable severe seizure disorder. Our lives were forever changed. We have remained unschoolers ever since. Many a Sunday night at 10:30 after several days of non-stop seizures, my daughter finally feels like doing school work. I have learned to literally “capture the moment” for working with Betty Boop because the amount of time she can focus before another seizure comes or fatigue sets in is many times literally only a moment! 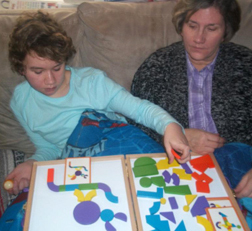 On good, seizure-free days you might find us putting together block puzzles, cutting and pasting, arranging craft sticks into patterns, tracing letters on iPad, coloring labeled circles with the correct colors, doing Montessori inspired activities, or working with math manipulatives. Most typical days begin with Bible reading, prayer, and devotions. My ten-year-old son loves spending time on the computer making music on Everybody Edits. He also likes doing science experiments. He recently finished the Jack Sparrow series of books. I must admit that I do require both my son and 16-year-old daughter to work through traditional math books, and my daughter also studies science with a traditional textbook as well. Other than that we would be considered unschoolers by most! What does the term unschooling mean to you? To me, unschooling means enjoying the privilege of being able to pursue our interests in a peaceful, loving environment. Education does not happen in an unruly, willy nilly way however. We do cover all subjects required by our state, just not in the traditional ways. What interests do your children have? Because unschooling allows for lots of time to pursue individual interests, my children have developed many talents such as drawing, computer programming, painting, writing, photography, videography, singing, songwriting, performing, instrument playing, knitting, crocheting, sewing, cooking, baking, crafting and helping others. Many of these talents are being used in their careers today. I am amazed at the awesome things my children have accomplished and very proud of the wonderful men and women that they have become. What are some of the benefits of unschooling? One benefit of unschooling is not needing to coerce my children into doing schoolwork. We do not have to fight over homework and my children do not have to rebel against being forced to complete assignments, although I’ll admit that I still have moments of being the “teacher”, but I am working on it! I love that we have a pleasant, close, and respectful relationship. What are some of the negatives of unschooling? One negative of unschooling and an example of a “worst” day is when I backslide into the anxiety of worrying that my children might have learning gaps. At these times I insist that they complete more structured assignments until I come to my senses once again! Thankfully, this does not happen as often as it once did. An example of a “best” day is when learning experiences present themselves naturally such as when visiting the seashore and we find all kinds of natural treasures to observe, marvel at and obsess over. Museum days and other types of informal field trips are also considered “best” days by the kids! Your favorite definition of unschooling. One definition of unschooling that I like is: Peaceful, pleasant, non-coerced learning in a calm, loving, and respectful atmosphere. Thank you Sylvia for this unschooling portrait!